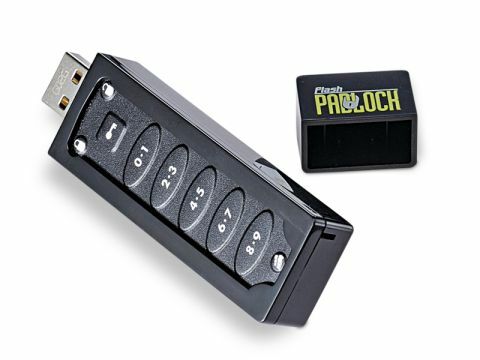 The genius of this Corsair 2GB Flash Padlock USB stick is that it carries a hardware lock, so you can protect data and use the stick on different Macs. These are quite hard to find. You can get software that will secure data on removable drives, but that locks you into using the drive on a Mac that has the software installed. Corsair's Padlock is software-free: there's nothing to install. It has a keypad and some firmware that lets you configure a PIN number. You use the key symbol button, colour indicators and the number pad to set yourself up, and we suggest reading the guide pamphlet carefully because you only get 15 seconds after you start to finish entering the code. The drive was easy to set up and worked well. It's so cheap that we can find little fault with it. The design is a bit clunky looking, but you're not buying this to look pretty, you're buying it to secure privacy.